If the Queen uses a PC, there’s every possibility the Archbishop might fall victim to Google-ing himself too. 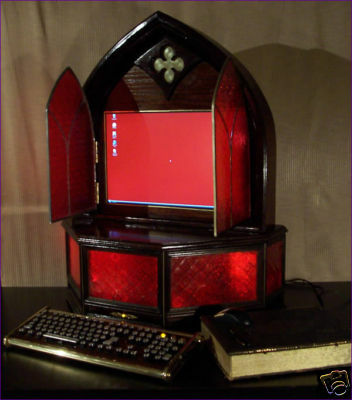 And if he was in the market for a new PC, wouldn’t this intricately hand crafted Archbishop Gothic PC just be the most apt machine his lordship could go for? It’s a pricey PC, but with a chassis like that there’s no surprises there. If he wants to be the coolest Archbisop in the history of bishopry he’ll have to be quick as there’s only one up for grabs on eBay for $7,000. The PC itself is a mid-level gaming PC, completely crafted by the hands of eBay seller Datamancer using hand crafted wood, and in true church style stained glass. It’s powered by an Athlon duel core processor, has a 20-inch LG LCD monitor and has polished brass keyboard with a wooden faceplate. With genuine antique typewriter keys, the Archbishop has an air of retro about it, too. Lastly, it smuggles in a Wacom drawing tablet (mouse and pen included) that remains hidden within an antique book with a concealed compartment for peripherals. And when his Lordship has finished browsing, he can close its stained glass doors and free it from dirt, dust and people looking to take advantage of his high-speed broadband access.